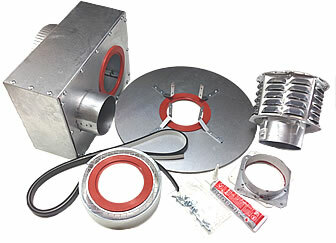 Sterling GG heaters can be converted to separated combustion when this kit is added to the heater. Separated combustion heaters draw combustion air from outside to ensure that the unit will always have plenty of fresh clean air. The fresh air supply reduces common concerns about dusty, dirty, or high humidity applications. You can also decrease heating costs by as much as 10% because no cold outside air is being sucked into the structure when the heater is running. What does the concentric vent kit do? The concentric vent kit allows the air intake and exhaust to vent to the outside wall with only one hole as shown in the picture above. Use for horizontal or vertical venting. Please note: Vertical installations vary, and additional pipe may be needed. Please read the Sterling GG Concentric Vent Manual to determine what your venting needs are. The concentric vent kit is not included with any of the pipe kits. 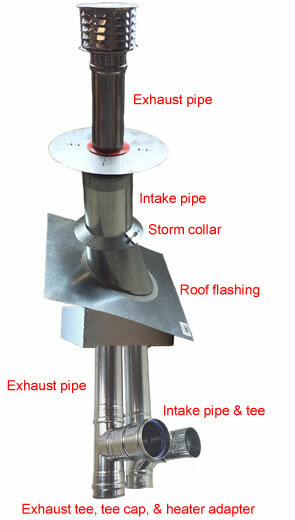 It must be purchased in addition to the pipe kit to have a complete vent system. Free shipping to anywhere in the USA except Alaska and Hawaii.